Leading the way at Ferry Meadows are (from the left) James Whitehead, James Mogridge, Paul Vernon and Lloyd Kempson. 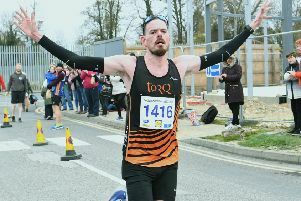 Yaxley Runners, Werrington Joggers and Eye Community Runners took full advantage of a late change in the Frostbite League race venue to Nene Park, finishing second, third and fourth teams respectively in what was effectively a home race. The race was due to take place at March, but because of the unavailability of the course the venue was switched to Ferry Meadows, a bonus for the Peterborough clubs. PACTRAC’s Paul Vernon is rarely beaten in the Frostbite League, and Sunday proved no exception as he covered the challenging 6.25 mile course in 28:28. Vernon had the company of Nene Valley’s Lloyd Kempson for the first four miles, but having raced the previous day, the Harrier sensibly dropped out when he felt a twinge in his calf. Werrington’s James Whitehead finished as runner-up with James Mogridge of Yaxley, Bushfield’s Phil Martin and Nene Valley Harrier Rob Brownlee all making the top 10. The Nene Valley team finished sixth, but were missing many key athletes due to their participation in Saturday’s North Midlands Cross-Country League race at Nottingham. Suzy West of Eye won the ladies race, finishing an excellent 43rd in 33:08, a full minute and a half clear of Ramsey’s Lisa Marriott in second place. Caroline Woods of Yaxley finished third with her team-mate Gina Crane also making the top 10. Owen Wilkinson of Nene Valley had a fine run winning the junior race, but he was the only local to feature towards the front of the field. Nene Valley are the highest placed Peterborough club in the junior standings, occupying fifth place, just behind Oundle based PACTRAC. With two races to go, the senior league is hotting up with Hunts AC and a resurgent Werrington Joggers clear of the pack. Werrington could yet pip Hunts AC for the league title, but to have any chance of doing so they will have to win the remaining races. Nene Valley are third with Yaxley two places further back.